You've Got Brand Ambassadors. Now What? 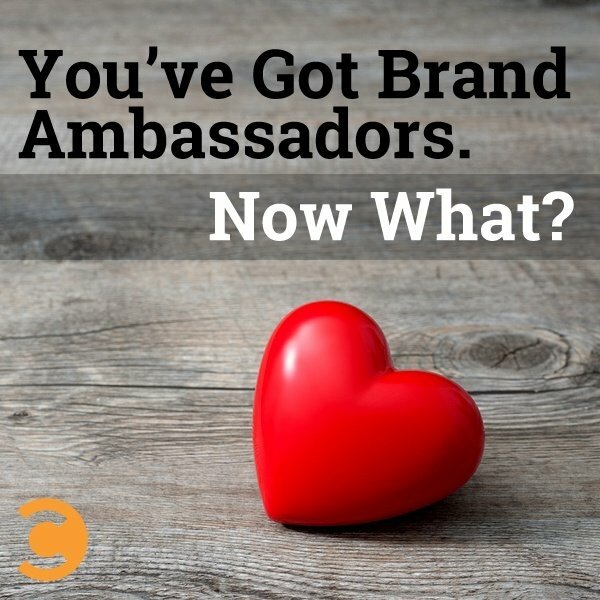 You’ve Got Brand Ambassadors. Now What? Yesterday I posted a case study on Bhakti Chai and how they have created a successful program of passionate brand ambassadors. If you missed it, get caught up here. I chose this brand because they are a great example of organizing and communicating with a brand’s most powerful influencer relationships—authentic fans! One of the things that stands out to me when I work with clients and chat with other marketers is that organizing and making the most out of a marketing relationship has become more tedious and delicate than finding influencers. We all know how to identify the right influencers and reach out to them, or we wouldn’t have this job. But once that part is done, WTF do we do now? This post lists a plethora of steps that you can take starting today on what to do with your brand advocates to turn them into marketing machines for your brand. One of the most important jobs a marketer has when managing a network of brand ambassadors is communicating with them. This is not to be confused with mass emailing them, asking them for constant favors or only checking in once a year. Bhakti told me they consciously touch base on a personal level with their ambassadors once a quarter. They do send mass emails, but it’s once in a while and only when they need their help in a timely manner for a product promotion. A successful brand ambassador network is built of a mutually beneficial relationship in which the brand and fan thrive and are happy with what they reciprocate with each other. It’s a very harmonious balance. And it includes authentic communication that doesn’t annoy them. Char-Broil is another one of my go-to examples of brand ambassador networks done right, and they consciously email their network once a month. They always make sure they are sharing information that the blogger and their audience actually care about. It may sound silly, but one of the things that has helped me come across as sincere and competent to the influencers I’ve worked with is to keep detailed notes about our communication and set relationship steps. Once I’ve identified someone as an ambassador, as opposed to an influencer who may eventually reach ambassador status, I put them in their own list. Sounds like a lot to keep up with, I know. Luckily, GroupHigh houses all of my marketing contacts, so I am fortunate enough to not have to keep up with a spread sheet of this information. Regardless of the process, I assure you it’s time consuming but worth it. What could be worse than not checking on an ambassador and letting the relationship fall through the cracks of relationship cyber space? Plus, when it comes time to promote something new, it’s great to have a bird’s eye view of all of the relationship statuses and notes pertaining to your marketing relationships. Sometimes it’s as simple as a single mention of your brand name to trigger an update from your network. Obviously, you don’t want to look desperate or like you’re using them, so make sure your relationship is mutually beneficial and reaches the fullest potential by implementing some of these creative ways for you to stay in touch. Monthly newsletter that highlights information about your brand that would pertain to their audience. Infographics or research that speaks to a pain point their network experiences. Send them SWAG every quarter. Re-share their content on your own social media channels, especially the content that doesn’t mention your brand—it’s just a nice gesture. Host influencer events catered to just them. This will also give them photo opps of their experience with your brand to share on their channels. Ask them for their feedback and actually use it. Give them a shout out for weighing in. The feedback that you gather through surveys, emails, in-person chats, tweets, etc. can be used in all areas of your brand. From utilizing your ambassadors to help you come up with a new logo, to helping you figure out the next flavor, to suggesting new retail locations for your product, they actually have more valuable input them some of your highest-paid employees. One piece to keep in mind is that members of your brand are immersed in it daily. You are not capable of looking at your own brand as an outsider. You are not able to provide a fresh set of eyes to brand image or a user experience. Your own opinion cannot be trusted. However, passionate brand fans who weigh in on different components of your brand bring both passion and the perspective of the consumers you are targeting. Do you have any tips or questions when it comes to a brand ambassador strategy? Let’s chat in the comments below, and cheers to a good discussion!